Dates for 2019 Farm Tours are being added as we speak! 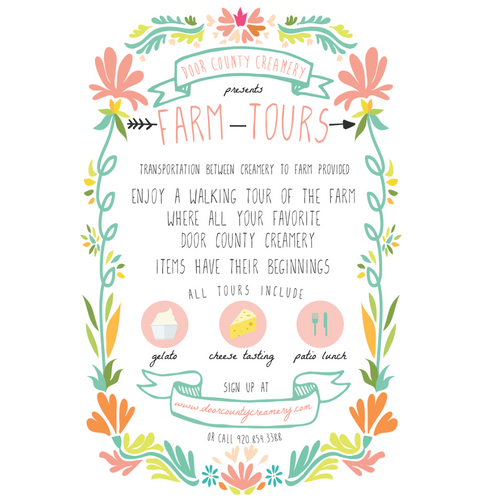 Enjoy a light walking tour of the farm where all your favorite Door County Creamery items have their beginnings. 2. Up close and personal encounters with our "daddy" goats, "mommy" goats and "baby" goats. Tours are $43 for Adults and $25 for kids ages 3-10. Water is included with lunch, other options available during reservation checkout. Tours typically last 2 hours with lunch. Tours leave promptly at 10 am from the Door County Creamery Parking Lot (Just South of the Creamery Building). Please come 15 minutes early to check-in.